This is a true and funny story. Have you ever played a practical joke on somebody that was using AutoCAD? Like, turn off the PICKFIRST variable? Or press CTRL+0 as you were casually walking by their workstation? How about altering their PGP file? Last weekend, while I was working on my next training video, I scripted and recorded a section on how to edit the PGP file in AutoCAD. The PGP file defines the command aliases for AutoCAD. It lets everyone know that if you type L on the command line, that AutoCAD will start the LINE command. In the video I suggested that you play a trick on somebody and change it so that every time they type L, the Plot Manager opens! Today, working on my videos again, I kept typing L and the plot manager opens! It took me three tries until I remembered what i did, to myself! that might have been the first time I played an AutoCAD trick on myself! When working in AutoCAD or one of it's vertical platforms, have you ever had a layer that you couldn't get rid of? If happens. You can delete a layer if it is empty, meaning that there is nothing using it. Sometimes it's a block that has an object in it that's on that pesky, non-deleting layer. If you are 100% sure you have an empty layer and you still can't get rid of it "nuke" it with the LAYER DELETE command. Just type LAYDEL on the command line. It will fully purge the layer and delete it. LAYDEL used to be an Express Tool, but now it's a core command in AutoCAD. Deadlines, what would we do without them? Deadlines pile up, more frequently than not. But that's a good thing. Without deadlines I might not ever get anything finished. I have tons of projects that I have started, but few that I have finished. The projects that have deadlines get finished. It's a funny thing, motivation. Deadlines are nothing more than a form of motivation. And getting paid is another popular motivator! Right now my biggest project is my next AutoCAD training video. The first one I made is called "AutoCAD Fundamentals". There are two versions, one for AutoCAD 2010 and another for AutoCAD 2011. The training video I'm working on now is called "Advanced AutoCAD Techniques", but honestly, that title may change, but the content is the same. AutoCAD Fundamentals is meant to teach a new user how to use AutoCAD from scratch! It will even work for AutoCAD LT. Advanced AutoCAD Techniques will go well beyond the basics. It will delve into advanced operations, referencing files, data extraction, customizing AutoCAD, animations, 3D Modeling, adn much more. I don't have a release date for it yet, but stay tuned. In the meantime, I'm putting together the very early stages of my next project. This next project revolve around training and the web. I don't have a date yet, but I am very excited about this. 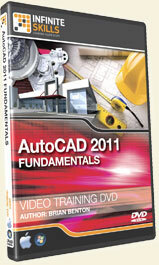 If you are new to AutoCAD go to my CAD-a-Blog Store page and follow the links to my training DVDs. If you need further training on AutoCAD and want to become an advanced user, my next video will suite you wonderfully. It will be here soon enough.